Pancakes, these tiny stove top cooked cakes are my younger one's favourite, he just love to eat pancakes to kick start his day. Pancakes are easier to prepare and quick to cook if you have dont have much time to spend in your kitchen. I have already tried couples of pancakes in my kitchen. Either they are with eggs or eggless, multigrains or else with fruits or vegetables, my space have already varieties of pancakes. However am yet to dish out some unique and healthy pancakes to feed my pancake loving kiddo. 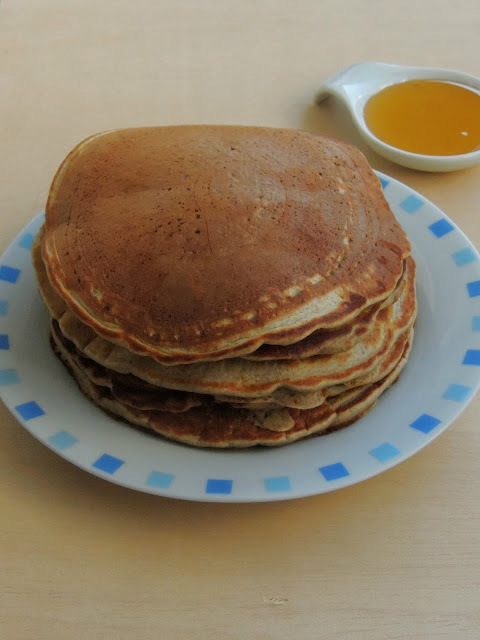 And my today's post is a fabulous,healthy, eggless, butterfree pancakes which calls for buckwheat flour, whole wheat flour, mashed banana along with usual ingredients. I have been cooking many dishes out of buckwheat flour recently, yes i love their earthy taste in any dishes they are added. Even i rolled some Indian style flatbreads recently to have for our dinner and we loved it with some spicy tomato chutney. Apart from their dull colour to the dishes they are added, this flour is definitely a healthy and incredible addition to our diet. Am running my first week of blogging marathon with Easy breakfast dishes, after blogging for a whole month of september we are back to our usual blogging marathon. To kick start this three days blogging marathon i opted for easy breakfast dishes. After posting two easy and healthy breakfast dishes, i couldnt stop myself to blog about this healthy pancakes which i preapred for my family few days back for our sunday brunch. 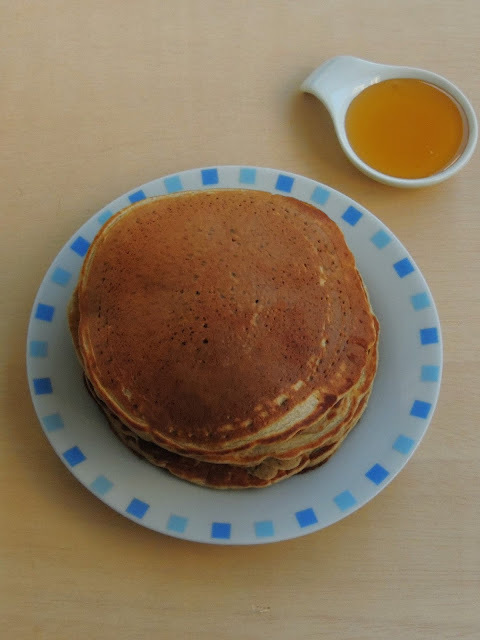 Buckwheat pancakes with banana makes an excellent breakfast or brunch friendly pancakes depending upon how you serve them. We had this pancakes with nutella,jam and honey. We enjoyed our brunch as these pancakes are quite filling and satisfying. If you dont have buckwheat flour, do prepare the same pancake batter with your favourite flour and any flour works awesome. Mix whole wheat pastry flour,buckwheat flour,banana puree,yoghurt,baking powder,vanilla extract maple syrup and salt in a bowl. Make them as thick batter, add water if needed to make the batter. Keep this batter aside for 15 minutes. Heat a nonstick pan,pour a ladle of this pancake batter, drizzle oil if needed. Cook in medium flame on both sides until they turns brown. These pancakes tastes too good when they are served warm. You can even freeze them for later use, once thawed heat them in a tawa and serve, dont microwave this pancakes. Pancakes are wonderful breakfast. Making them healthy with buckwheat flour is a nice idea. Those pancakes look soft and fluffy and absolutely yum..
My little one is a pancake freak and I am sure she will love these as well. A nice way to sneak in buckwheat flour. The pancakes look really soft and fluffy... and healthy with the buckwheat flour too! Beautiful stack of pancakes there. Love that you used buckwheat and wholewheat pastry flours in there. Will have to try these out for my kids. The pancakes look so good Priya.My elder one loves pancakes and this will surely be one of her favorites! Pancakes are loved by kids as well as adults.. this is such a healthy version. This is such a healthy and yummy option for breakfast, the pancakes looks so light and fluffy loved the recipe. 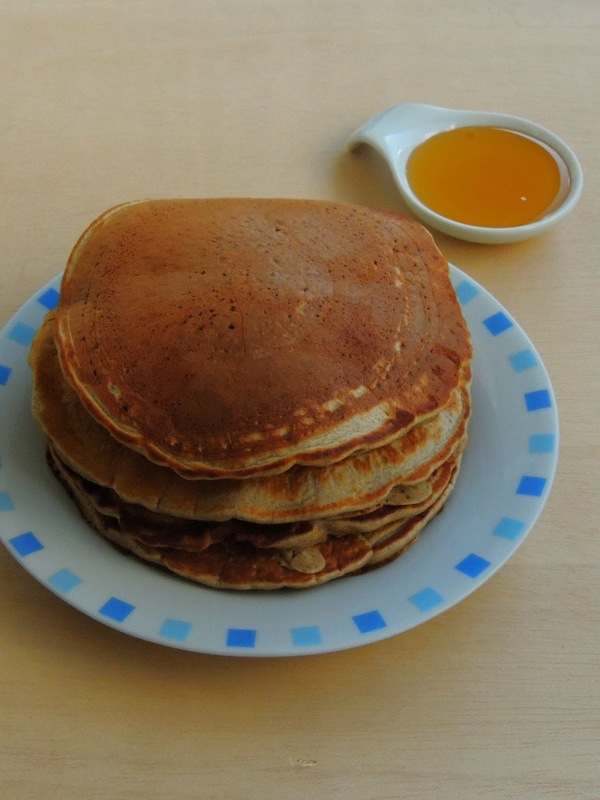 Pancakes made with buckwheat flour makes it more healthier. Loved the upped health quotient here. Lovely, healthy and beautiful stack of pancakes. So glad to find it is eggless! I am sure your family loved this dear; I like to enjoy with some honey or even pickles!! 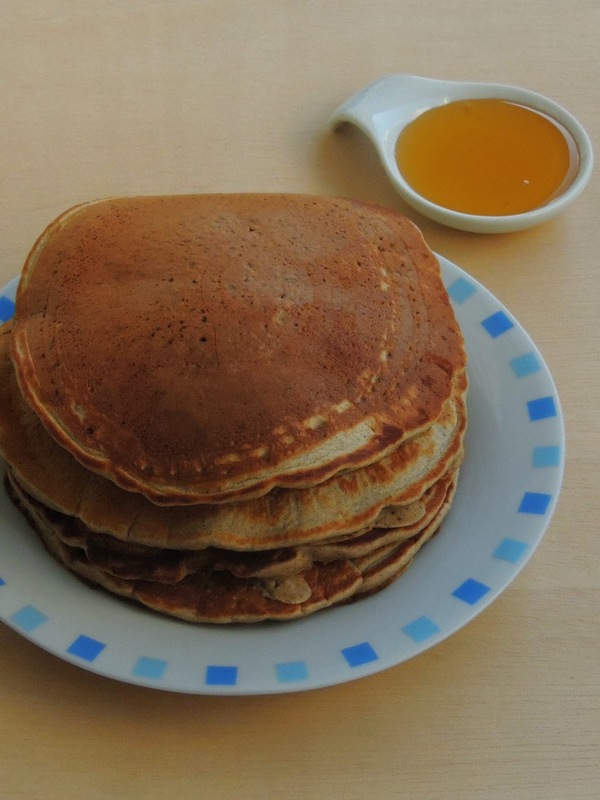 I often make banana pancakes with oats flour. They are my son's favourite. I loved the use of healthy buckwheat flour in these pancakes. Thanks for the share Priya. Lovely fluffy healthy pancakes..its great you take care of your younger one's cravings in a healthy way. Pancake is a regular breakfast at my home. You have shown me how to make it healthy with buck wheat flour. Its time for me to switch to healthy option. I love pancakes , they are so easy to make and fees the kids. Buckwheat and banana sounds a great combination, must try. There is no time I turn to your blog and not be inspired. I love the way you have used buckwheat flour. Lovely. Love that stack of healthier pancakes you got there. I haven't yet tried buckwheat flour in my kitchen and this would make a great recipe to try it out. Oh my those pancakes look so good Priya. I have the buckwheat flour and this recipe surely is a great one to use it for! Priya, absolutely love the texture of the pancake and what a great recipe to use buckwheat flour. Great way to start the day. Wow that is one healthy and delicious pancake recipe. A healthy start for the day. yum. Perfect breakfast option. Pancake sounds so healthy and delicious. Superb share. Wow priya, those pancakes look so soft and fluffy!! !lovely start to the day!!! Perfect breakfast!